There's a name you don't hear enough in movies, unless you're deep into cinema-verite documentaries: David Sutherland. The fellow makes intimate portraits, sometimes covering many years, in the lives and travails of rural Americans - farm-country and cattle-ranch folk, the sorts of honest, real people whom Hollywood either generally ignores or patronizes in widely scattered awards-bait dramas such as A THOUSAND ACRES. Sutherland's features, such as OUT OF SIGHT, THE FARMER'S WIFE and KIND HEARTED WOMAN are typically aired on PBS as docu-miniseries, showing what "reality-TV" could be if done well and unscripted. But in today's high-speed days of NSA terrorism, "twerking" Disney starlets, Browns coach firings and economic death spirals, WHO HAS THE TIME??!! to get absorbed into a David Sutherland-style narrative. The Cleveland Cinematheque has an answer to farm-cinema, with a rediscovery of French filmmaker Dominique Benicheti's 1972 COUSIN JULES. Beginning his film shoot in 1968 and covering several years, Benicheti eavesdropped on his octogenarian cousin Jules Guiteaux, dwelling as a farmer in the French countryside. The resulting film compresses the agrarian existence of Jules and his wife Felicie into just 91 minutes. It is something of a backhanded compliment (or not) that the movie still feels like years passing by. Unbroken by narration - hardly even any dialogue at all - the filmmaker's mise-en-scene is a slow, detailed study of routine chores and daily rituals of life, shot in glorious deep-focus color Cinemascope. Here is Jules (a stoic man with a face recalling a faded Gallic matinee idol) at his home workshop/ blacksmith's forge, or taking his harvest of bundles of...something...to market. Even though Felicie and Jules are the same age, she looks old enough to be his mother (and her mangled hand bears a missing index finger in what must have been a painful accident at some point). There is barely any conversation between the two - just some small talk about the meal being hot or who gets to make the coffee now. Midway through the non-storyline, poor Felicie dies (just signified by a static long shot of a gravedigger at work). One can almost miss the milestone, the main evidence being a silent Jules continuing his mundane activities around the farmstead and hearth, now alone except for a pet cat. 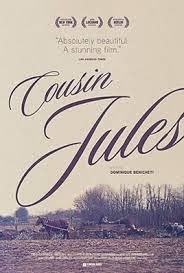 COUSIN JULES isn't trying to dazzle or mesmerize; it's more like an ethnographically faithful scrutiny of its subjects, though the viewer (if not drowsing off) senses affection and admiration rather than the cold, professional detachment of the scientific observer. Just why this is, I can't exactly say. Just a feeling.